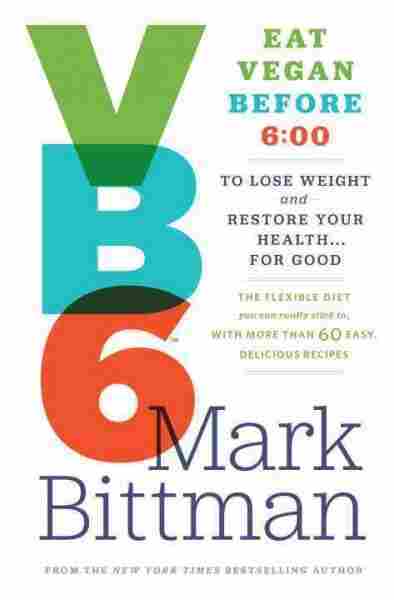 VB6 NPR coverage of VB6 Eat Vegan Before 6:00 to Lose Weight and Restore Your Health ... for Good by Mark Bittman and Dean Ornish. News, author interviews, critics' picks and more. The New York Times columnist builds on the theories of his earlier book Food Matters to outline a menu plan that eliminates meat and animal products throughout the day to promote weight loss and overall good health. Six years ago, the man I most trusted with my health said to me, "You should probably become a vegan." Not exactly the words I'd wanted to hear, and certainly not what I was expecting. But I'd asked Sid Baker, my doctor of thirty years, what he recommended, given that he'd just told me that at age 57, I had developed the pre-diabetic, pre-heart-disease symptoms typical of a middle-aged man who'd spent his life eating without discipline. He'd laid out the depressing facts for me: "Your blood numbers have always been fine but now they're not. You weigh 40 pounds more than you should. You're complaining of sleep apnea. You're talking about knee surgery, which is a direct result of your being overweight. Your cholesterol, which has always been normal up until now, isn't. Same with your blood sugar; it's moved into the danger zone." A more conventional doc would've simply put me on a drug like Lipitor, and maybe a low-fat diet. But Lipitor, one of the statin drugs that lowers cholesterol, is a permanent drug: Once you start taking it, you don't stop. I didn't like the idea of that. Furthermore, its effectiveness in healthy people has never been established, and it's also been implicated in memory loss and other cognitive complications; I didn't like the idea of any of that, either. And at this point, low-fat and low-carbohydrate diets have essentially been discredited: They might help you lose weight, but they're not effective for maintaining that loss in the long term, and they may even wreak havoc on your system. But becoming a vegan? A person who eats no animal products at all? Calling that a radical change to my lifestyle was more than a bit of an understatement. Yet it was clear that something had to be done. I asked Sid, "Is a compromise possible? Any other ideas?" "You're a smart guy," he said. "Figure something out." I thought about this for a few days, and I recognized that what he was saying made sense. There are no silver bullets, and over the years it's become increasingly clear — much as none of us wants to hear it — that the most sensible diet for human health and longevity is one that's lower in animal products and junk food and higher in vegetables, fruits, legumes, and minimally processed grains. I knew that, and I'm guessing you do, too. Yet the idea of becoming a full-time vegan was neither realistic nor appealing to someone accustomed to eating as widely and as well as I do. Furthermore, I had no interest in becoming an isolated vegan in a world of omnivores and — though I have vegan friends, to be sure — the world of omnivores is where I live. Full time. So the question became: What could I do with the conflict between what was undoubtedly Sid's very sound advice — "become a vegan" — and my own established, beloved, well-socialized lifestyle? The answer, to me, was this: I'd become a part-time vegan. And for me, this part-time veganism would follow these simple rules: From the time I woke up in the morning until 6 in the evening, I'd eat a super-strict vegan diet, with no animal products at all. In fact, I decided to go even beyond that: Until 6 p.m., I'd also forgo hyper-processed food, like white bread, white rice, white pasta, of course all junk food, and alcohol. At 6 p.m., I'd become a free man, allowing myself to eat whatever I wanted, usually — but not always — in moderation. Some nights, this meant a steak dinner; some nights, it was a blow-out meal at a good restaurant; other nights, dinner was a tunafish sandwich followed by some cookies. It ran, and runs, the gamut. Whatever happened at dinner, though, the next morning I turned not to bacon and eggs or a bowl of Trix but to oatmeal or fruit or vegetables. For lunch, rice and beans or a salad — or both. Throughout the day I snacked on nuts and more fruit. I called the diet "vegan before six," or VB6. And it worked. A month later, I weighed myself; I'd lost 15 pounds. A month after that, I went to the lab for blood work: Both my cholesterol and my blood sugar levels were down, well into the normal range (my cholesterol had gone from 240 to 180). My apnea was gone; in fact, for the first time in probably thirty years, I was sleeping through the night, not even snoring. Within four months, I'd lost more than 35 pounds and was below 180 — less than I'd weighed in thirty years. And the funny thing was, the way I ate in the daytime began to change the way I ate at night. So why be vegan just until 6 o'clock? Am I suggesting that 6 p.m. is some kind of magical metabolic witching hour? Not at all. Truthfully, the hour itself doesn't matter much, and if you habitually eat dinner very early, your plan may be VB5 — or VB9, if you live in Spain. The point I was making to myself, and that I'm saying to you, is that dinnertime sets you free. Dinnertime, because that's when you're likely to want to eat the most, because that's when you're most likely to drink (and lose discipline! ), because that's when you're most likely to combine eating with socializing, an important and even beneficial thing. But even though the time itself is arbitrary, it has the power to make you stop and think before acting. In fact, the rules are what VB6 has in common with "regular" diets; because anyone can say (and many people do), "Eat sensibly, don't overeat, increase your consumption of fruits and vegetables, eat less junk and high-calorie, low-nutrition foods." If it were that easy, there'd be no need for diets. But by telling you "Don't eat animal products or refined foods during the day, and feel free to eat what you like at night," VB6 gives you the structure you need to exercise limited but effective discipline in a way that accomplishes all of those things. During the day you'll be observant, and eat way more fruits and vegetables than you probably have until now, and virtually none of the foods that we know cause your metabolism to go haywire, putting a downward spiral in motion. In the evening, you'll still eat more thoughtfully, but won't necessarily avoid or limit foods you love and can't imagine eliminating from your diet. Simply put, at 6 o'clock you can put "the diet" on hold — a compromise that offers the benefits of restraint without the hardship of perpetual denial. Even reading this now, six years after I began, it still sounds pretty good to me. This is not to say that my adapting to VB6 was seamless. I wasn't exactly "becoming a vegan," but this new diet was certainly not the way I was used to getting through the day. In 2007, when I first embarked on this plan, I'd been a professional food writer (and eater!) for more than twenty-five years. My diet had become increasingly indulgent and untamed, and my opportunities for eating "well" — that is, lavishly — were near constant. I had few rules and, I thought, little need for them. Like many of us, I ate what tasted good to me. Even before this conversation with Sid, my thinking about food and eating had begun to change — enough so that his suggestion that I become vegan wasn't completely out of left field. I knew, for example, that we Americans eat too much junk food and too many animal products. I knew that food was being produced in an increasingly mechanized and unprincipled manner, without taking into account the welfare of consumers — that's us — or the environment or animals or the people who grew or processed it. And I knew that our health as a country was going down the tubes, and that the Standard American Diet (SAD for short, and it is just that) was at least in part responsible. The combination of thinking that way and my new way of eating led to profound changes in my life; it changed not only my diet but my work. I didn't want to become a preacher or even a teacher, but the more I thought about our diet, the more I practiced VB6, the more I recognized that these changes were essential not only for our health but for that of the planet and many of the things living on it. There's no lack of subject matter, that's for sure: Food touches everything. You can't discuss it without considering the environment, health, the role of animals other than humans in this world, the economy, politics, trade, globalization, or most other important issues. This includes such unlikely and seemingly unrelated matters as global warming: Industrialized livestock production, for example, appears to be accountable for a fifth or more of the greenhouse gases that are causing climate change. But chances are you didn't buy this book to save the planet, or to improve animal welfare, or even to think about those things. You probably bought this book because you wanted to improve your own health or, even more specifically, because you wanted to lose weight. If that's the case, you've come to the right place, because VB6 can help you do both of those things. My own weight has stabilized and my health has improved over the course of the last six years, and VB6 can do the same for you and help you to do it, not with some two-week snake-oil miracle cure — though you'll probably see changes for the better in the first two weeks you're on this diet, if you take it seriously — but with an easy-to-make change that you'll want to stick to for the rest of your life. And best of all, you will be able to do just that while eating as well as (or better than) you ever have before, and without denying yourself any food you really love. From VB6: Eat Vegan Before 6:00 by Mark Bittman. Copyright 2013 by Mark Bittman. Excerpted by permission of Random House.